SG-MD1 is a 5.5" x 4" PCB that attaches to the REF signal from an HP/Agilent or similar two-frequency laser, and the MEAS signal from an optical reciever through an interferometer returned from a movable retro-reflector (mirror or cube-corner), and provides a visual readout of position change in increments of the wavelength of light at 632.8 nm. The intent of this system is to be used to demonstrate the principles of precision measurement based on two-frequency laser-based interferometry. In a nutshell, the two-frequency laser sends out a pair of superimposed beams that differ in frequency by a relatively constant amount (called REF), one polarized horizontally and the other polarized vertically. Optics separate the two beams sending one to a (generally) fixed reflector, and the other to some tool or device whose position needs to be measured precisely. Both beams then return to an optical receiver where the difference frequency (called MEAS) is generated. With no movement, the phase relationship between the two beams is constant and MEAS equals REF. But if the tool or whatever moves, the frequency and thus phase relationship between REF and MEAS will change due to doppler shift. A phase change of 360 degrees represents a position change of 1/2 wavelength of the light from the laser, approximately 632.8 nm for the HeNe lasers most often used. The precise wavelength is nominally 632.991372 nm with a wavelength accuracy of 0.1 ppm for the typical HP/Agilent laser. Using the two-frequency approach rather than a basic Michelson or similar interferometer, among other things makes these systems more immune to misalignment by eliminating issues of fringe counting and direction, and fringe contrast. In the diagram below, SG-MD1 replaces the "Signal Processing" block and provides a means of demonstration the basic principles of precision measurement using two-frequency laser interferomtery. Aside from the low cost, this also allows for much more hands-on since the schematics are available and all signals are accessible for monitoring. SG-MD1 is conceptionally quite simple. It consists of dual differential line receivers for REF and MEAS, edge detection, synchronizer, 8 digit BCD up/down counter and display, UP and DOWN monitor circuit, and control PAL. Dual differential line receivers: REF and MEAS are applied to the UA9639 (U2) with the resistor networks R1-R3 and R4-R6 used to set input levels for either single-ended or differential operation. The output of U2 should be TTL level squarewaves (approximately) for REF and MEAS. Edge detection: The cleaned-up REF and MEAS signals may be applied to a dual D-FF 74LS74 (U3) used to divide each by 2. The edges of the resulting waveform now represent the locations interest. By dividing by 2, the frequency of operation of subsequent circuits is essentially halved as well. If the D-FFs are bypassed, the resolution is doubled (smallest increment is halved). More on this below. Synchronizer: The first stage of the 8 stage 74LS164 shift registers (U4 and U5) synchronize the REF and MEAS edges with the system clock. The next 7 stages are used to reduce the probability of metastability to less than 1/(age of Universe). :) The metastability isseu is the possibility that the asynchronous edge will be sampled precisely when it is changing, resulting in indecision in the sampled result. This can produce a voltage in between legal TTL levels which persists for a time much longer than the propogation delay specifications of the flip-flop inside the shift register. This phenomenon is not generally taught in Intro to Logic courses but can be responsible for infrequent but catastrophic failures in logic systems. It is a fundamental consequence of the uncertainty prinsiple and can never be eliminated entirely. But with 7 additional shift register stages, the chance of this bogus level making it to the subsequent logic is minimized. If it could be guaranteed that REF and MEAS edges would never be coincident, the synchronizer wouldn't be needed and the up/down counter could be driven directly. However, nearly coincident pulses to the up/down counter would result in unpredictable behavior - counts could be dropped, extra counts could be introduced, and the counter could even count incorrectly. Since REF and MEAS are locally asynchronous based on the motion of the remote retro-reflector or mirror, the relative timing of the edge is totally arbitrary. 8 digit BCD up/down counter and display: U21-U28 (74HC192 BCD up/down counter with separate Up and Down clock inputs), U31-U38 (74LS47 seven segment decoders), and U41-U48 (high brightness orange seven segment LEDs) provide this function. Up and Down monitor circuit: The dual monostable (U7, 74LS123) drives Up (green) and down (red) LEDs. The respective LED is pulsed only when 2 Up or Down pulses occur in a row. This elminates the constant activity that would otherwise be present. The logic inside U6 looks at the REF and MEAS edges and converts these to Up and Down pulses to the counter and monitor LEDs. Depending on mode, it may suppress strictly alternating Up and Down pulses to eliminate activity in the display when the position isn't changing. Simultaneous Up and Down pulses are always suppressed. It also provides the proper signals to implement signed-magnitude mode in the unsigned BCD counter including the Sign Overflow bits. Depending on the objectives, an interferometric measurement system can be put together from commercial or home-built components. The latter would have an accuracy and precision virtually equal to that of the commercial version but would have a net cost that is a small fraction of it, and would have potentially much greater educational value. Note that some basic soldering/assembly skills will be needed to wire up the cables to the power supplies, laser, optical receiver, and SG-MD1. If that capability is NOT available, then consider a complete system with SG-MD1 included instead. DC power supply: Either a lab supply, a linear or switchmode wall adapter can be used, or something else that produces 5 VDC at 1 amp or more. But it must be regulated with an allowable voltage range under load of 4.75 to 5.25 VDC. If in doubt about the regulation, measure the output of the candidate power supply with no load. A regulated supply will read close to 5 VDC even with no load, but a typical unregulated wall adapter might read 50 percent high - or more. Note that while some lasers provide a 5 VDC output, this likely does not have sufficient current capacity, so a separate 5 VDC supply will probably be required. There are two power connectors on the PCB. While either one can power the unit alone, it is recommended that power be attached to both to best distribute the current. Cables with suitable connectors already attached are included with SG-MD1. Double check polarity before applying power! The PCB is reverse polarity protected but your power supply will see a near-short circuit if wired backwards! Two-frequency HeNe laser with a beat frequency between 100 kHz and 4 MHz. The easiest laser to use would be a Hewlett Packard (HP) or Agilent 5501A/B, 5517A/B/C/D, 5518, or 5519A/B, with the standard cable for power and REF. However, it's also possible to use an Excel laser (which should be functionally equivalent) or even a Laboratory for Science or some other similar laser instead. Zygo may also have a suitable laser, though the ones I'm aware of have a beat frequency that is way too high. Or, you can build the equivalent using a short random polarized HeNe laser tube, magnet(s), and simple stabilization electronics. See the chapters: "Commercial HeNe Lasers" and "Home-Built HeNe Laser". Such a laser would be nearly equivalent in performance to a $10,000 (new price) HP or Agilent model. The laser must provide a well collimated beam with the two frequency components linearly polarized, orthogonal to each other, and aligned with the horizontal and vertical axes. The required output power will depend on how the REF and MEAS signals are obtained. For HP/Agilent optical receivers, it can be under 25 microWatts (uW). So, even a laser that doesn't meet the HP/Agilent specifications of 120 or 180 uW can be perfectly suitable. To get decent range and signal from the optical receiver(s), the beam should be expanded and collimated to around 5 mm or larger. The commercial lasers will already do this, but for a home-built laser, a beam expander will probably be necessary. The local and remote return beams would have different wavefront curvature and size unless the path lengths are close to each-other. This would greatly reduce detected (MEAS) signal level, if one could be detected at all. Commercial two-frequency lasers are readily available on eBay at a small fraction of their new price. A laser that starts and locks reliably, even if it has low (below HP/Agilent spec) output power would be satisfactory. If possible, obtain the mating cable for your laser as these are generally rather special. But "hot wiring" directly inside the laser is also possible. It's only 3 wires for power and 2 or 3 wires for REF. These lasers typically run on +/-15 VDC. Check the requirements and obtain appropriate power supplies. They don't need to be from the laser manufacturer. Any regulated power supply that has sufficient current capacity should work. Source for REF: The HP/Agilent lasers provide this output as a differential pair that can be attached directly to SG-MD1. But a non-polarizing beamsplitter to sample a portion of the laser beam, with an HP/Agilent optical receiver could also be used if the laser doesn't provide REF internally (as when using a very weak laser). Or rather than a commercial optical receiver, a polarizer at 45 degrees, silicon photodiode, and resistor can be used instead to produce the electrical REF signal. However, non-standard resistors on the REF input to SG-MD1 may be needed to accomodate your voltage levels. Interferometer optics: These can be any of the configurations discussed in the chapter: "Laser Instruments and Applications". The simplest would be a so-called "linear interferometer" with remote retro-reflector (cube-corner). Either a commerical (e.g., HP/Agilent 10702A/10703A) or home-built version made from a large polarizing beam splitter and a pair of conrner-cubes can be used. Optical receiver for MEAS: A commercial unit like the HP/Agilent 10780 (any version) is easiest. (A 10780F/U will require a polarizer at 45 degrees if used without the fiber-optic cable and remote probe.) But as with REF, a home-built receiver using a polarizer, silicon photodiode, and resistor. will also work. Stable platform: The laser, interferometer optics, and optical receivers should be mounted on a stable platform. Optimally, this would be an optical table or optical breadboard. But, I've literally used a wooden butcher-block with good success. Since these components don't need to be changed once they are set up, shims can be used to fine tune heights and so forth. If a metal base is used, HP/Agilent optical receivers should be mounted using Nylon screws to avoid ground loops. Signed-Magnitude Select (SGNMAG, JB1): Open for Signed-Magnitude, installed for unsigned. No Single Count Oscillation Suppression (NOSCOS, JB2): Installed to disable Single Count Oscillation Suppression (SCOS). Note that having SCOS enabled will result in 1 count hysteresis on the measurement output but less activity on the display if the position isn't changing. SCOS is always applied to the UP and DOWN monitor LEDs. D30 (JB4) and D28 (JB5): 4,000,000 and 1,000,000 initial count for RESET. Open for "1". D30 MUST be 0 in Signed-Magnitude mode. Lamp Test (LT, JB6): Install to force all segments on. With reliable LED displays, the main use of LT may be to check maximum power supply current! Resolution (RES, JB7): This jumper determines whether only the rising edge (X1), or both edges (X2) of the REF and MEAS signals are used in the position determination. Install for X2. Using X2 will produce correct results on average, but may be more sensitive to jitter from a weak MEAS signal. Power (J1 and J5, 2 pin, +5 VDC at 1 amp max. ): As noted above, attach the power cable provided to your regulated DC power supply. REF (J2, 4 pin): Pins 1 and 4 are the differential inputs; pins 2 and 3 are ground. MEAS (J3, 4 pin): Pins 1 and 4 are the differential inputs; pins 2 and 3 are ground. 5    UP_H        High during clock cycle counter is to go up. 6    DOWN_H      High during clock cycle counter is to go down. 7    OVFLQ_H     High if overflow in Signed-Magnitude mode. 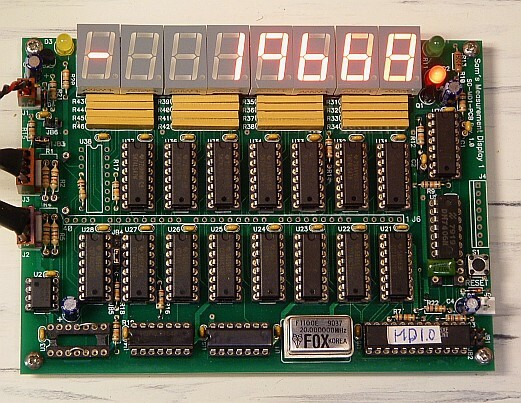 Counter Output Header: This is a 40 position set of pads which will accept a SIL header to monitor the 32 bit output of the counter (8 digits or 7-1/2 digits plus sign). It includes several ground pins as well. Since these signals are not buffered, it is recommended that wiring length be minimized to minimize the chance of peculiar behavior. The main readout is an 8 digit high brightness orange seven segment LED display. In unsigned mode, the entire 8 digits (99,999,999) is available for position measurement. This results in a totally ridiculously high range of 30 meters with a single beam or linear interferometer. or 15 meters with a plane mirror interferometer. In signed-magnitude mode, 7-1/2 digits (+/-19,999,999) are available for position measurement. This results in a range of +/-6 meters with a single beam or linear interferometer. or +/-3 meters with a plane mirror interferometer) The "-" segment of the MSD is used as the sign. A yellow OVERFLOW LED will be turned on should the count exceed the allowable range of +/-1,999,999. Once overflow is detected, the display resets to 0 and won't change until the RESET button is pushed or the RESET_L line on J4 is asserted. However, the monitor LEDs will continue to function. The UP (green) and DOWN (red) monitor LEDs provide a rough indication of measurement activity. Each of these are pulsed on by a retriggerable monostable when an up or down pulse is generated. Note that the activity of these LEDs is independent of the setting of the NOSCOS jumper - they always only show activity that isn't strictly altnernating up and down. In other words, two successive MEAS pulses without a REF pulse is required for the UP LED to pulse, and two successive REF pulses without a MEAS pulse is required for the DOWN LED to pulse. Note that when changing very slowly, both LEDs may sometimes come on simultanenously even if the counter seems to be strictly incrementing or decrementing due to even slight jitter in the REF or MEAS signals, and unequal high and low times, especially if using X2 resolution. The default pulse width for the monitor monostables is about 1 ms, so counts in the range of 0 to 1,000 per second will result in a roughly linear variation in brightness. This can be altered by replacing C1 and C2 with different uF values, which may be desirable if motion is mostly very slow or very fast. The resolution determines both the minimum detectable incrment in position as well as the maximum range before overflow or wraparound on the display. Interferometer optics: Using a plane mirror interferometer doubles resolution compared to the linear or single beam interferometer. Resolution jumper: Doubles resolution if installed. Edge FFs: Bypassing the two flip-flips doubles resolution. However, note that using the edge FFs doubles the maximum input frequency for REF and MEAS. So, a system with a REF or MEAS frequency of up to 16 MHz and a |MEAS-REF| difference frequency of up to 8 MHz would work correctly (if there is such a thing). Any combination of these may be used but of course, increasing resolution also reduces the maximum position change that cna be displayed (though I doubt this is of much concern!). Also, higher resolution tends to increase the effects of noise and jitter on display behavior at very slow count rates and will mostly show up in the monitor LEDs both flashing at low count rates. The recommended settings for SG-MD1 where resolution isn't critical is to bypass the edge FFs but to leave JB7 open. Single-ended TTL: R1 (R4) = 1K ohms, R2 (R5) = 300 ohms, R3 (R6) = 500 ohms. Input is applied to pin 4. Differential (HP/Agilent optical receiver): R1 (R4) = open, R2 (R5) = 250 ohms, R3 (R6) = 500 ohms. Input is applied to pins 1 and 4. The HP/Agilent signals can be used single-ended (e.g., only using REF, not both REF and ~REF) but the noise immunity will be reduced. Mini-coax or twisted pair is recommended for the REF and MEAS cables. Note that the REF and MEAS channels are processed identically on SG-MD1 so the only chnage resulting from swapping them will be to invert the direction of counting. As labeled, UP is when the frequency of MEAS is greater than REF. What optical components are available will influence which configuration is most appropriate and easiest to implement. Micrometer adjusted linear stage: Check the accuracy of your micrometer. :) This is certainly the simplest and most straightforward. Voice coil positions (loudspeaker woofer) with function generator: Show how very low amplitude signals can be converted to motion and detected. Or, use the loudspeaker as a microphone and detect sounds! Machine tool: Attach the cube-corner or mirror to the carriage on your Southbend lathe or Bridgeport milling machine. The function generator provides a means of moving a mirror by a very small and well controlled amount, with its signal monitored by an oscilloscope. This could be done in a variety of other ways, including simply a micrometer adjustmentable linear stage. A version using a plane mirror interferometer is shown, because that makes more sense for attaching to a loudspeaker than a bulky cube-corner. Power the laser and optical receiver and wait for the laser to come READY. Once the laser and other components are in the general position of where they are to be located, first align the laser beam with the interferometer. For a single beam interferometer, the laser beam should be centered within the clear aperture. For a linear or plane mirror interferometer, it should be offset about 1/4 inch horizontally from the center, resulting in a return beam for F2 (without the remote retro-reflector) of about 1/2 inch. This spacing is not critical as long as both the outgoing and return beams aren't cut off. The interferometer and laser beam axes should be aligned. Align the optical receiver (or photodiode) with the return beam. There may be a detected signal even without the remote reflector, especially if the laser is higher power (e.g., 400 uW). This is due to imperfect coatings and imperfect alignment. Monitor the signal level (there is a testpoint on the HP/Agilent recievers for this) and fine tune the interferometer alignment to minimize it. Set up the remote cube-corner or mirror (as determined by the specific interferometer configuration) so that its return beam is precisely superimposed on the return beam to the optical receiver. At this point, there should be s strong signal. If you have an oscilloscope, it will be at the REF frequency of the particular laser and should appear clean with minimal jitter. For demonstration purposes, the reflector can be relatively close to the interferometer, but that is not required. It would certainly be more dramatic to have it across the room! However, for larger distances, the quality of the cube-corner or mirror may be more critical. And, vibrations caused by HVAC or a bus down the street will show up in the readout! With genuine HP/Agilent optics, it's very easy to get all this working together. Even modest misalignment can be tolerated, though the signal quality may degrade somewhat. Once everything is aligned, make sure it's all locked down. Except for the remote reflector (cube-corner or mirror), nothing else should move! Once the laser, optics, and optical receiver are set up, it's time to connect SG-MD1. Check/set jumpers on the SG-MD1 PCB. Default would be JB3, JB4, and JB5 installed. This selects signed-magnitude mode that will reset to 0. Do NOT plug in REF or MEAS just yet. Check the power wiring. Make sure the polarity is correct and your 5 VDC power supply is adequate. Configure the input resistors for REF (J2, R1, R2, R3) and MEAS (J3, R4, R5, R6). Power up SG-MD1 and press the RESET button. (There is no automatic power-on reset.) The display should show a "0" in the LSD. Make sure the laser is READY before proceeding. Plug in the REF cable. The display should count down at a high speed (the REF frequency) until the OVERFLOW LED comes on and it resets to 0. Plug in the MEAS cable and then press RESET again. The OVERFLOW LED should go off. Full UP: There is no REF input. Note that prior to the laser locking (READY off or flashing), UP will flash periodically with corresponding rapid counting while the laser is initializing. The OVERFLOW LED will come on eventually. But if the laser is READY and there is still unexplained full speed counting up, check wiring to the REF output of the laser. If your laser is very weak, the internal REF signal may not be present. (The REF detect circuit may have been disabled with the detect bit set to ON.) Also check the REF configuration resistor values and wiring. Full DOWN: There is no MEAS input. The most likely cause would be misalignment of the return beam in the interferometer, followed by a wiring problem, MEAS configuration resistor values, or a defective optical receiver or no power to it. Check that the display shows the expected change when the remote reflector is moved. Once proper operation has been confirmed, the entire system can be powered at the same time. Then, when the laser comes READY, just press the RESET button. My present setup includes both SG-MD1 and an HP-5508A. From left to right are frequency counter on top of 5 VDC power supplies for SG-MD1 and the buffer amp for the loudspeaker, SG-MD1 on top of the HP-5508A, my power supply for 5517A lasers (presently unused), and function generator on top of oscilloscope. The readouts differ both because SG-MD1 displays half-wavelengths compared to the HP-5508A's microinches, and they weren't initialized identically. A large variety of problems can be caused by issues with DC power. So, first check that the +5 VDC and GND connections are secure and that the supply voltage is within +4.75 to +5.25 VDC from no load to max load. Install the Lamp Test (LT) jumper to turn on all segments of the display to get close to max load. Most other problems are related to either REF and/MEAS signal integrity, or interferometer alignment. Symptom: No LEDs (display or indicators) on when power is applied. Possible cause: Lack of +5 VDC power. Solution: Check and correct power problems. Symptom: Up (green) LED on solid. Possible cause: REF signal missing or input resistors (R1-R3) incorrect. Solution: Check wiring. Use scope to trace REF signal through differential receiver and correct input resistor configuration if needed. Symptom: Down (red) LED on solid. Possible cause: MEAS signal missing or input resistors (R4-R6) incorrect. Solution: Check wiring, optical receiver, and its power supply. Use scope to trace MEAS signal through differential receiver and correct input resistor configuration if needed. Possible cuase: Interferometer misaligned or improperly set up. Solution: Double check that interferomter configuration is correct. Adjust alignment using optical receiver signal LED and/or test point to maximize signal strength. Symptom: MEAS signal present even if remote optical path is blocked, and no activity when retro-reflector or mirror is moved. Possible cause: Interferometer misaligned around optical axis or improperly set up. Possible cause: For higher power (e.g., 500 uW) lasers, this may be normal due to unavoidable reflections from AR-coated surfaces. Once the return beam is properly aligned, this will not be an issue. Solution: Fine tune interferometer alignment. If this doesn't help, the sensitivity of the optical receiver and/or laser power (using ND filter) may be reudced to minimize confusion. Possible cause: Vibration resulting in optical path length changes. Even a fan running in the next room or transit bus down the street may be enough to produce detectable position variations. Possible cause: Excessive jitter in REF due to interferometer misalignment and/or a laser with amplitude oscillation, especially if the laser is rather weak. Solution: Check REF and MEAS signals with oscilloscope to determine if excessive jitter is present. The normal REF and MEAS waveforms should be almost perfectly clean. If any jitter is detectable, it should be less than the trace width. Check and fine tune interferometer alignment. If this doesn't help, power cycle laser and monitor MEAS for evidence of a beat frequency around 700 kHz in between periods of normal MEAS frequency. If present, this may be contributing to the excessive jitter, especially if the lsaer is rather weak. The laser may need to be refurbished. See the Lsaer FAQ, chapter on "Commerical HeNe Lasers", for details. Symptom: Excessive activity with remote retroreflector or mirror stationary and average reading is erratic. Possible cause: Noise on REF and/or MEAS signals, or incorrect resistor configuration at their differential receivers. Solution: Check waveform integrity with oscilloscope. Correct wiring or connection issues if signal isn't clean. Confirm resistor configuration agrees with your signal wiring (single-ended or differential). Symptom: No monitor LED activity and readout doesn't change even though retroreflector or mirror is moved. This means MEAS is present but is not changing. Possible cause: Interferometer is misaligned and MEAS signal is only artifact of local reflections. Solution: Check and correct alignment of interferometer. Reducing laser power (with an ND filter) and/or using "alignment aperture" in shutter wheel will make this easier. Possible cause: Both REF and MEAS are missing or RESET is asserted. Configure the resistors on the REF and MEAS inputs for single-ended TTL. Configure the jumpers as desired. Apply power and press RESET. The display should read 0 or 00,000,000 depending on the settings of LZS and SGNMAG. It may be desirable to install 10 uF capacitors across C1 and C2 so the monitor LEDs will pulse for a longer amount of time with each count. (For electrolytic caps, plus should be on pins 15 and 7.) However, the ~1 ms flashes using the default capacitors should be clearly visible under reduced lighting conditions. SG-MD1 is now running just as it would with the real REF and MEAS inputs except that you are providing them manually! Pressing the MEAS pushbutton should result in the counter incrementing by 1 count while pressing the REF pushbutton should result in the counter decrementing by 1 count. Pressing both pushbuttons at the same time should result in no net change. Of course, relative to the system clock (typically 10 MHz), your presses will never be quite simultaneous but the effect will appear that way! NOSCOS=1: Strictly alternating pushbutton presses will result in the counter incrementing and decrementing by 1 count, but the respective monitor LED will not flash. In signed-magnitude mode (SGNMAG with LZS), attempting to decrement past 0 using the REF pushbutton will result in the sign changing to negative and the counter incrementing, and continuing to increment after that with repeated REF presses. Pressing MEAS will then reverse this. Tests of other configurations should be self evident. If none of this is able to identify the problem, it may be necessary to use an oscilloscope to probe the internal signals. The following assumes that the RES jumper is set for X2 and the edge FFs are present. Different settings will change the maximum measurement range in an obvious manner. Also see the section on "Selecting resolution", above. REF and MEAS inputs: Single-ended or differential, 5 V p-p max, compatible with TTL, CMOS, and other common logic signal levels. REF frequency range: DC to 8 MHz subject to |MEAS-REF|< 4 MHz. MEAS frequency range: DC to 8 MHz subject to |MEAS-REF|< 4 MHz. Display format: 7-1/2 digit 0.56 inch LED signed-magnitude (0 to +/-19,999,999 or 8 digit unsigned (0 to 99,999,999 representing number of complete cycles of position/change at 633 nm. PCB may be underpopulated for reduced range. Maximum measurement range: In signed-magnitude mode, equivalent to approximately +/-6 meters (linear or single beam interferometer) or approximately +/-3 meters double resolution (plane mirror interferometer). In unsigned mode, 30 and 15 meters, respectively. Single count oscillation suppression: Enable or disable. Data output: Header location provided for all counter bits. Activity monitor: Green (up) and red (down) LEDs whose brightness is proportional to rate of count. Error indication: Signed-magnitude overflow forces counter to zero and turns on yellow overflow LED. Sign indicates direction of overflow. System must be reset to clear error. Initialization: Reset via on-board pushbutton. Initial value selected by jumpers may be 0, +10,000,000, +4,000,000 or +50,000,000 (the last two valid in unsigned mode only). Jumpers: Unsigned, no single count oscillation suppression, leading zero suppression (must be on for signed-magnitude mode), lamp test, resolution. External control: Input: Reset (low); Outputs - up, down, monclk, overflow (signed-magnitude only). Connectors:: Power, REF, MEAS, External Control, Data Output. Power requirements: 5 VDC at 1 A max. Size: 5-1/2" (Width) x 4" (Height) x 0.5" (Depth). Back to SG-MD1 Table of Contents.